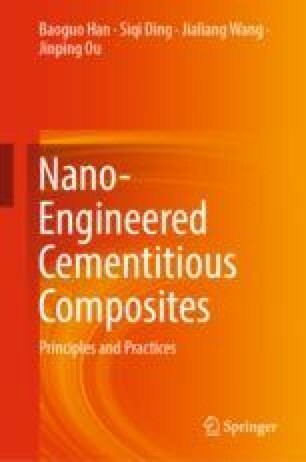 Carbon nanotubes (CNTs) with unique physical properties and morphology characteristics are incorporated into cementitious composites to reinforce/modify their properties/performances. The effects of type and content of multi-walled CNTs on the rheology, mechanical properties/performances, durability and functional/smart properties/performances of fresh and hardened cementitious composites are investigated. The enhancement/modification mechanisms are analyzed through X-ray diffraction, nuclear magnetic resonance, thermogravimetry and scanning electron microscope, and electrochemical impedance spectroscopy tests in combination with theoretical calculation. The feasibility of using self-sensing CNTs-engineered cementitious composites for traffic detection is also verified. Experimental results show that CNTs have an obvious impact on the properties/performances of cementitious composites due to their excellent mechanical/electrical/thermal properties, large aspect ratio, tubular structure, and low density, thus providing the opportunity to develop strong, durable, and smart/multi-functional infrastructures.